SKU: ICD43. 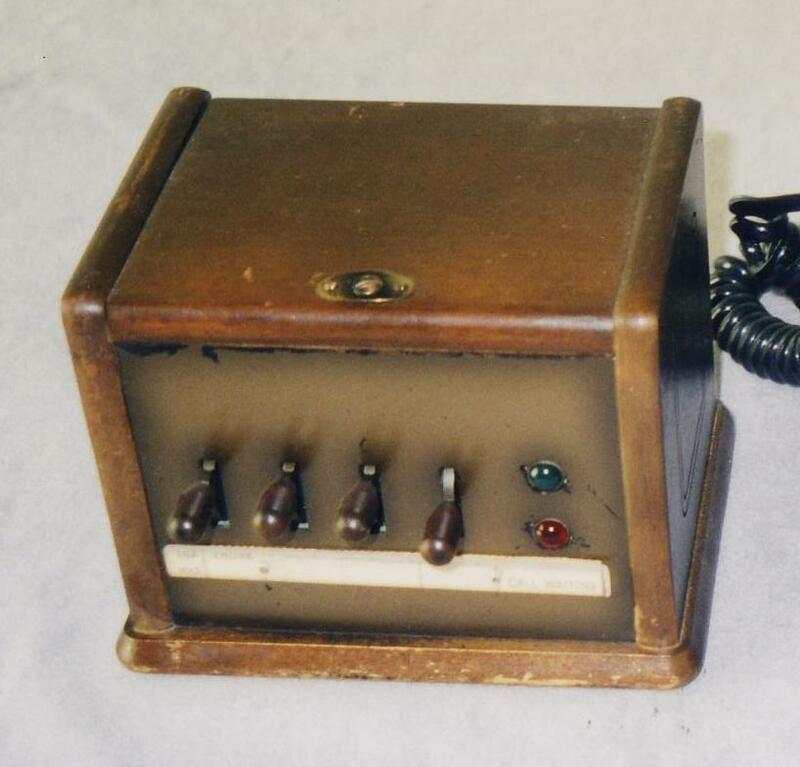 Desk intercom. 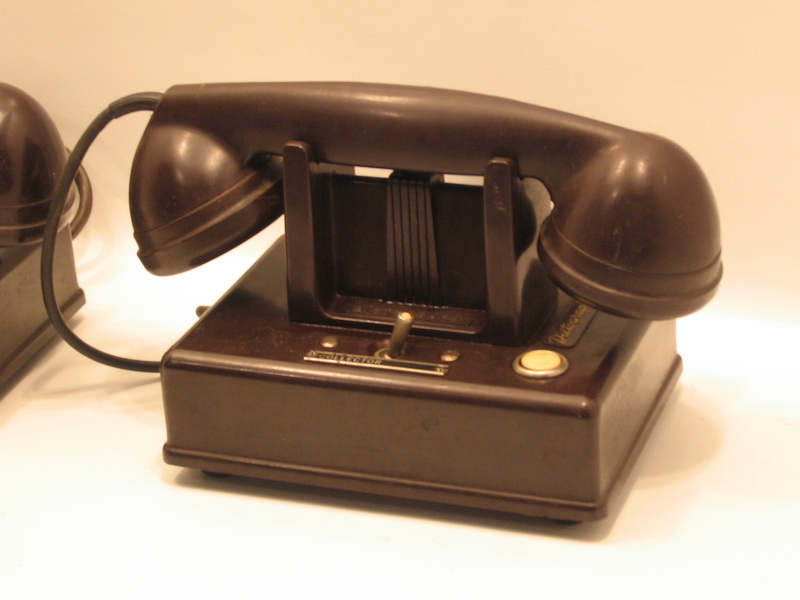 Art deco style shown with period phone (DPND13). Circa 1920. SKU: ICD12. 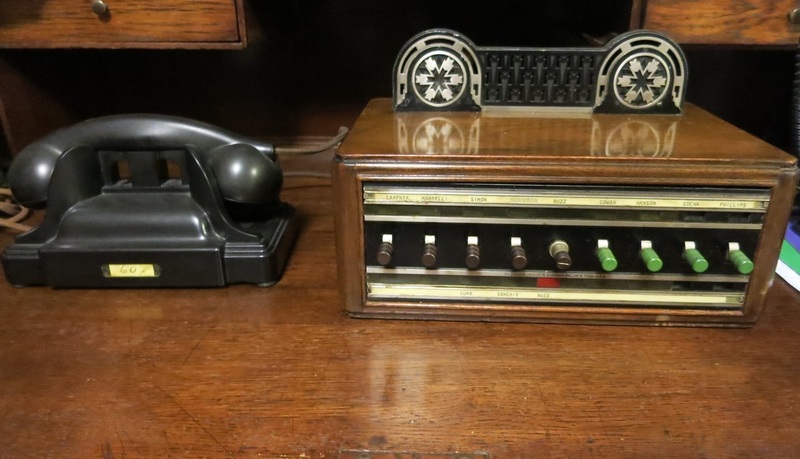 Desk intercom 12-station. Black: quantity 1. Circa 1930. English. SKU: ICD37. Graybar interphone 16-station. 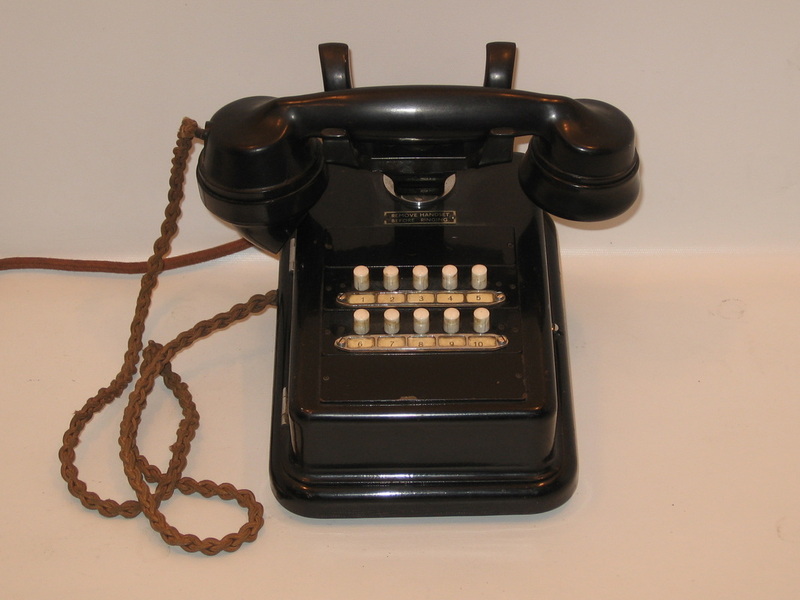 Shown with non-dial desk phone.Black: quantity 2.Circa 1920. SKU: ICD01. 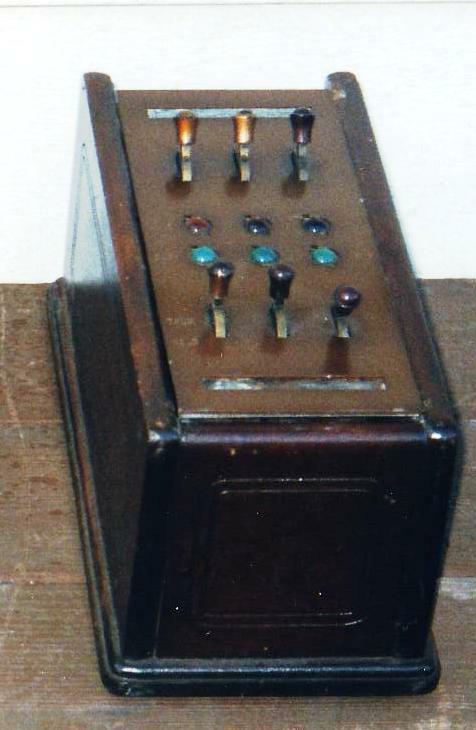 Desk intercom 10-station. Black: quantity 1. Circa 1930. English. SKU: ICD06. 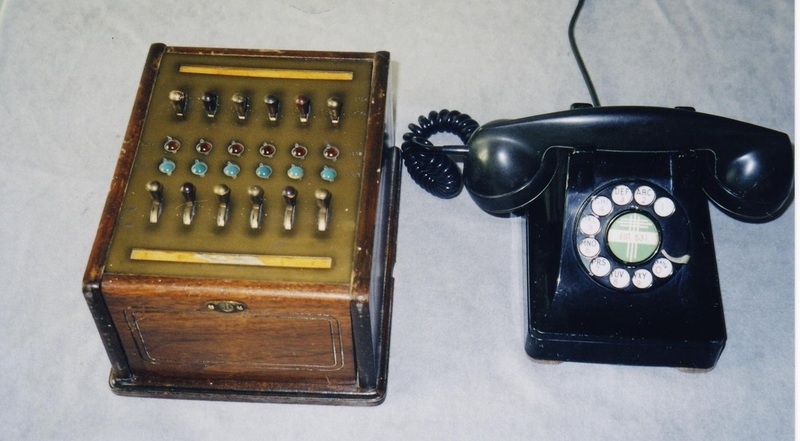 Magnaphone master station. Blue: quantity 1. Circa 1930. SKU: ICD06. Magnaphone master station. Grey: quantity 1. Circa 1930. SKU: ICD28 . Magnaphone substations shown with master station. Grey: quantity 3. Circa 1930. SKU: ICD11. 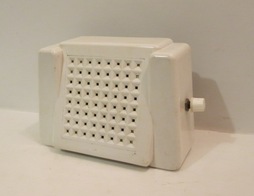 Desk intercom - plastic 10-line. Black: quantity 5. 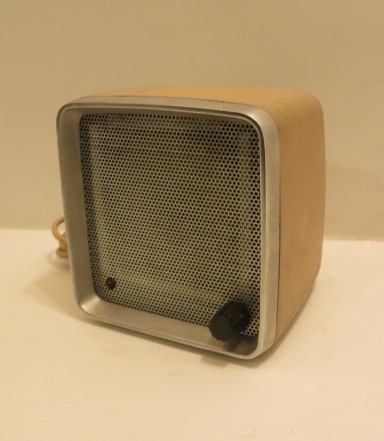 Also available in wall intercoms- see item ICW31. Circa 1930. England. SKU: ICD02. 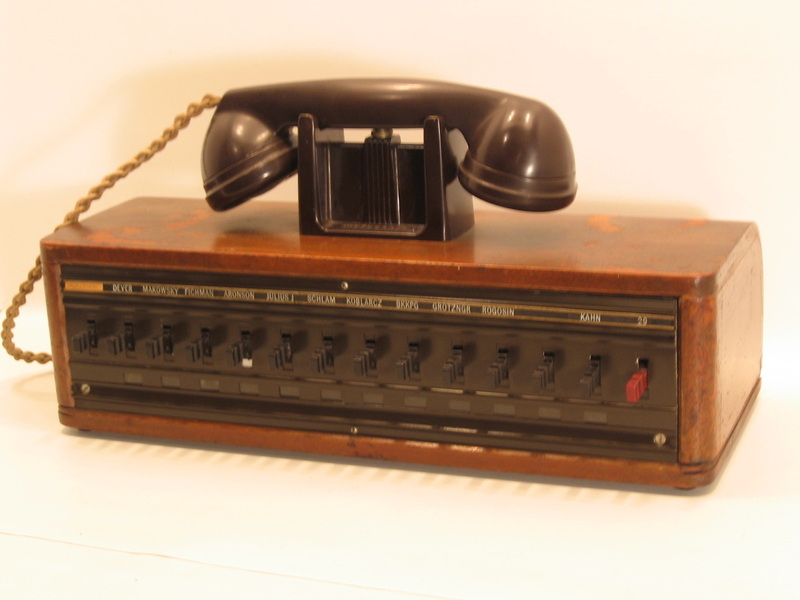 Desk intercom 5-line. Black: quantity 2 Circa 1930. England. SKU: ICD44. 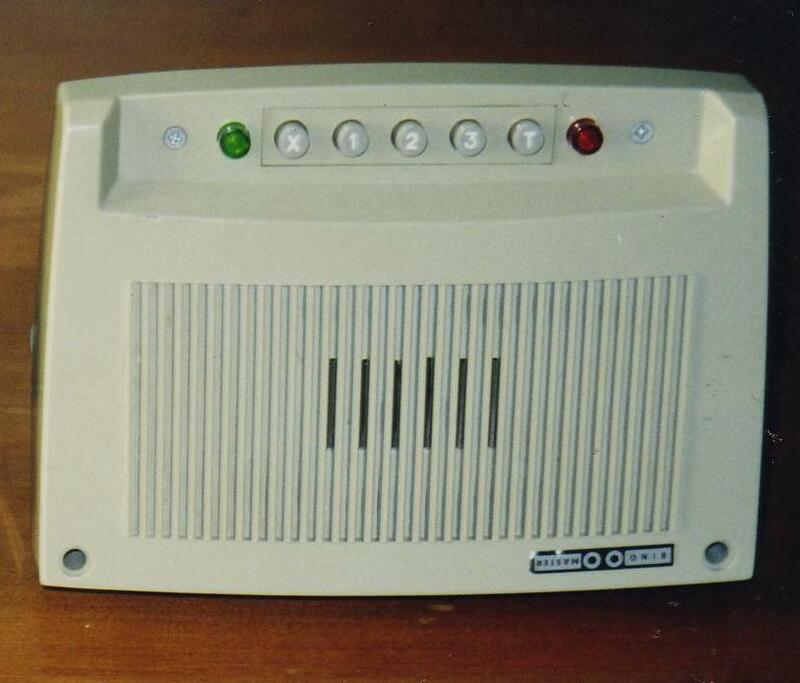 Desk intercom 20 line. Black: quantity 1. Circa 1930. England. SKU: ICD13. 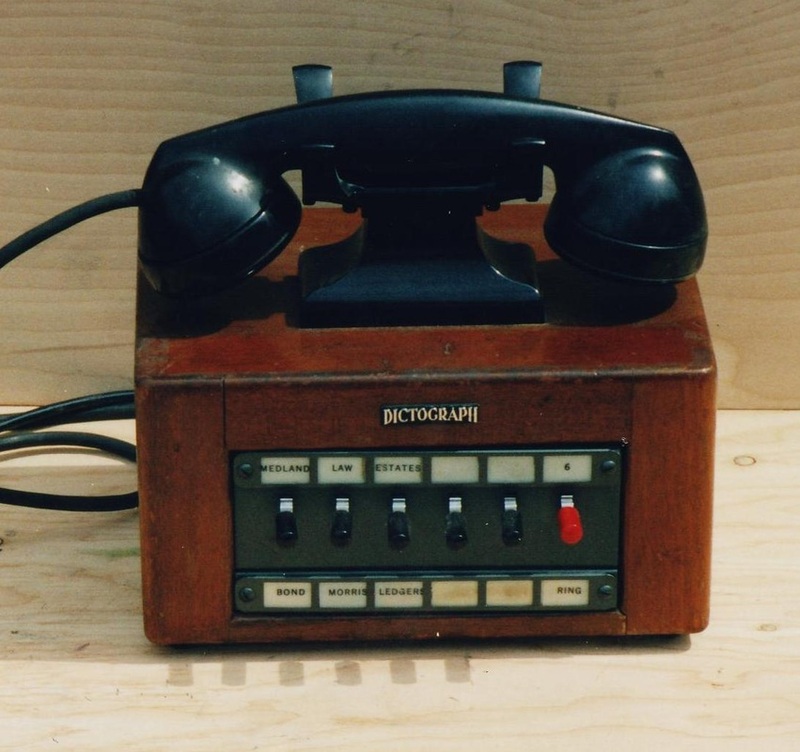 Dictaphone 5-line. Maple: quantity 1. Circa: 1930. SKU: ICD14. 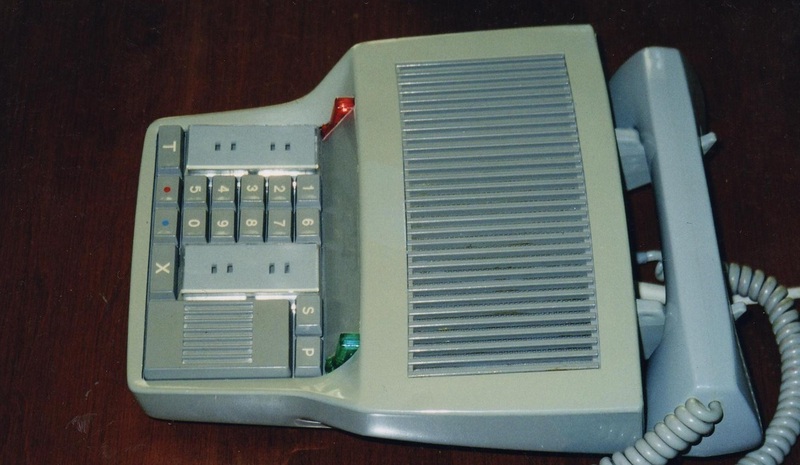 Dictaphone 3-station. Wood: quantity 1. Circa 1930. SKU: ICD35. 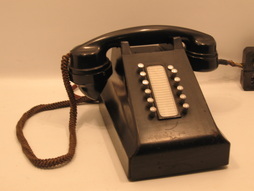 Edwards 12-line desk intercom. 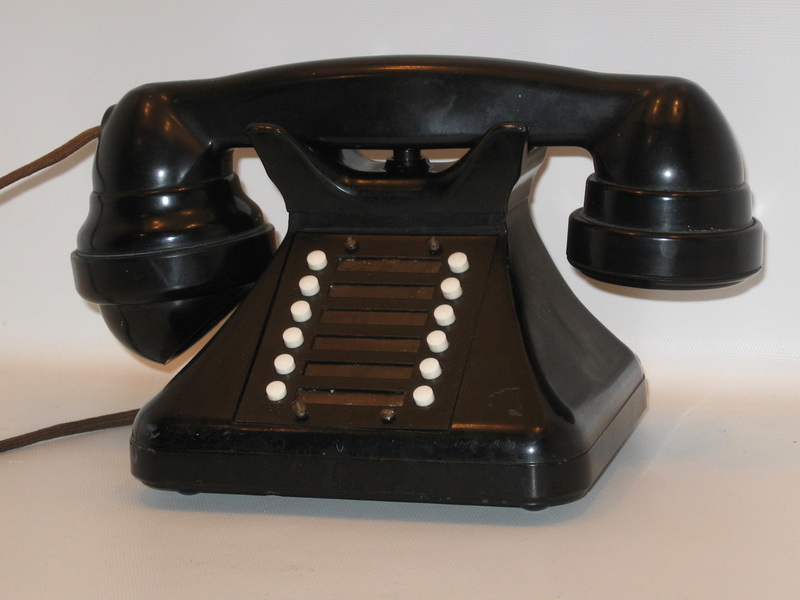 Black bakelite: quantity 1. Circa 1930. SKU: ICD38. 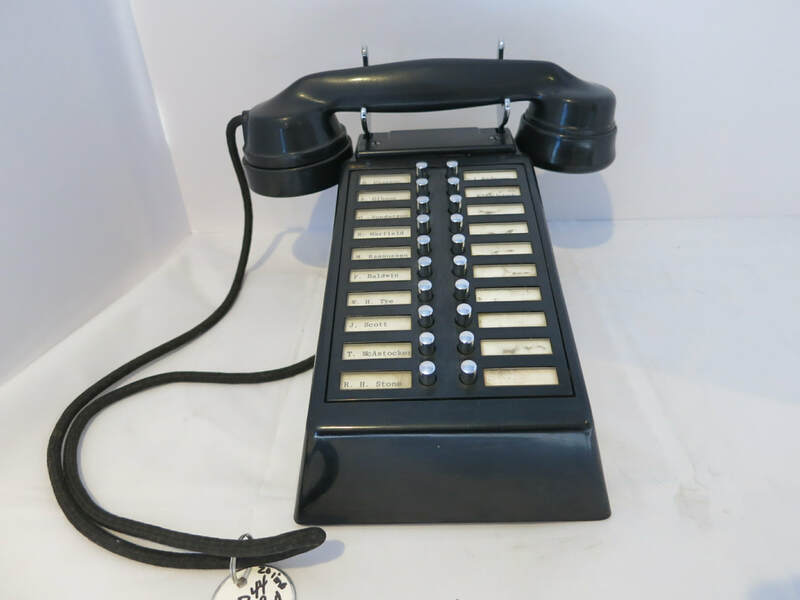 WE 10 button metal desk intercom show with multiline desk phone.Black: quantity 1. Circa 1930. SKU: ICD29. 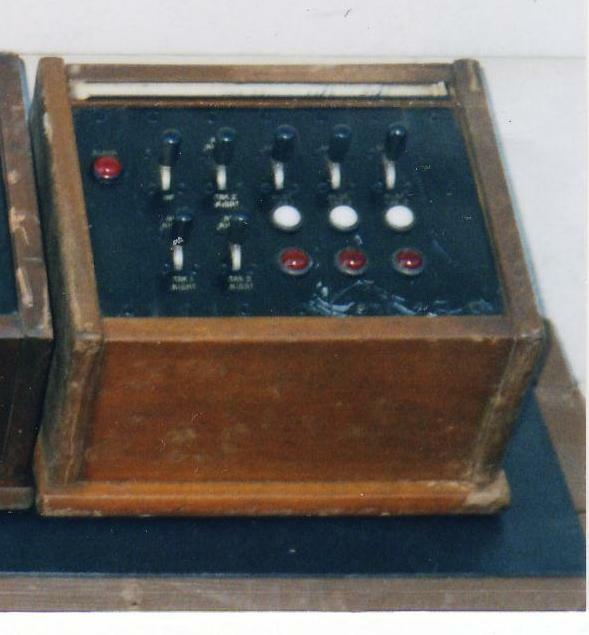 Dictagraph 14 switches. Wood: quantity 1. Circa 1940. SKU: ICD07. 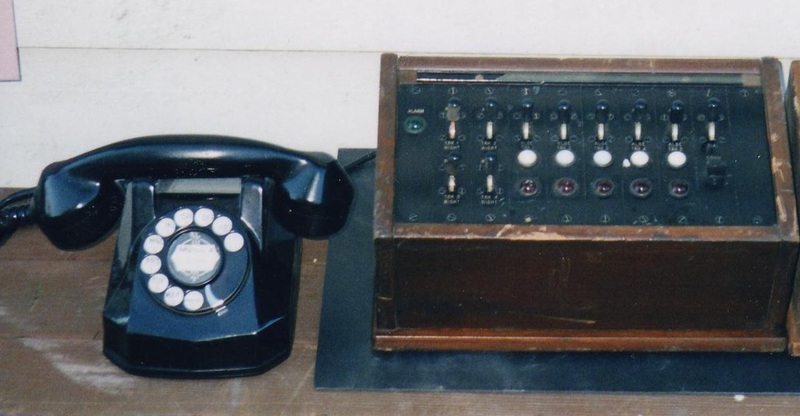 Epcol intercom master station - 6-station. Brown: quantity 1. Circa 1940. SKU: ICD39. 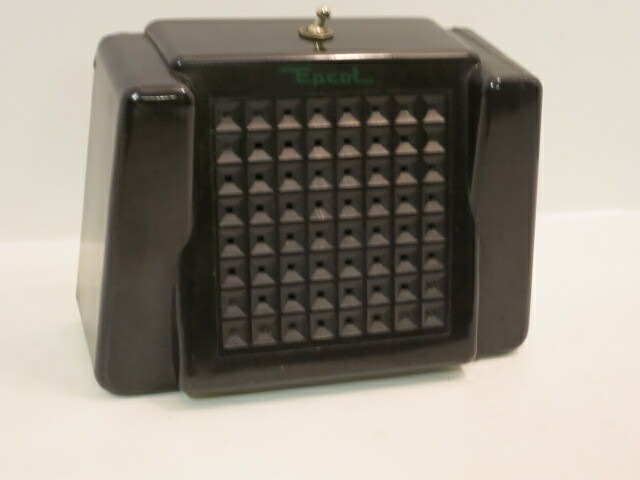 Epcol 1-button intercom substations. White: quantity 1. Circa 1940. SKU: ICD39. 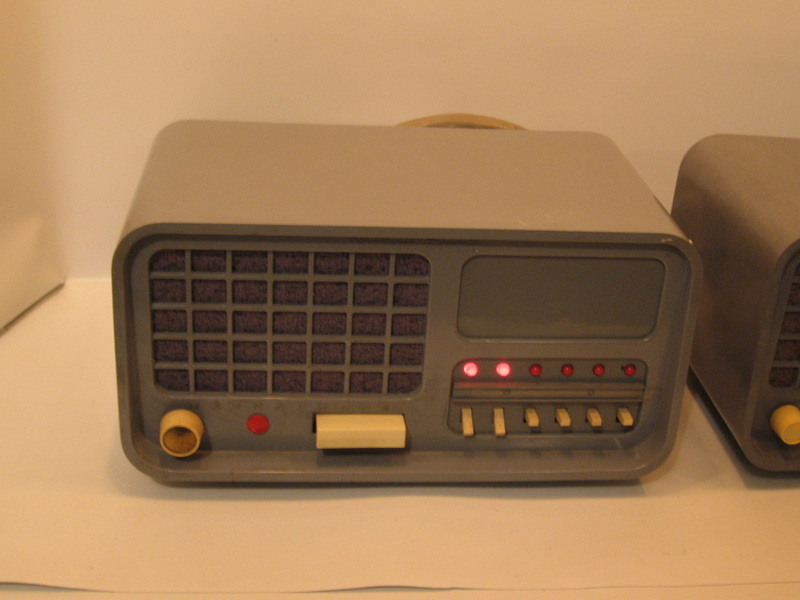 Epcol 1-button intercom substations. Brown: quantity 2. Circa 1940. SKU: ICD08. Dictagraph plastic 2-station. Brown: quantity 2. Circa 1940. SKU: ICD09. Dictagraph 12-station. Wood: quantity 2. Circa 1940. SKU: ICD10. 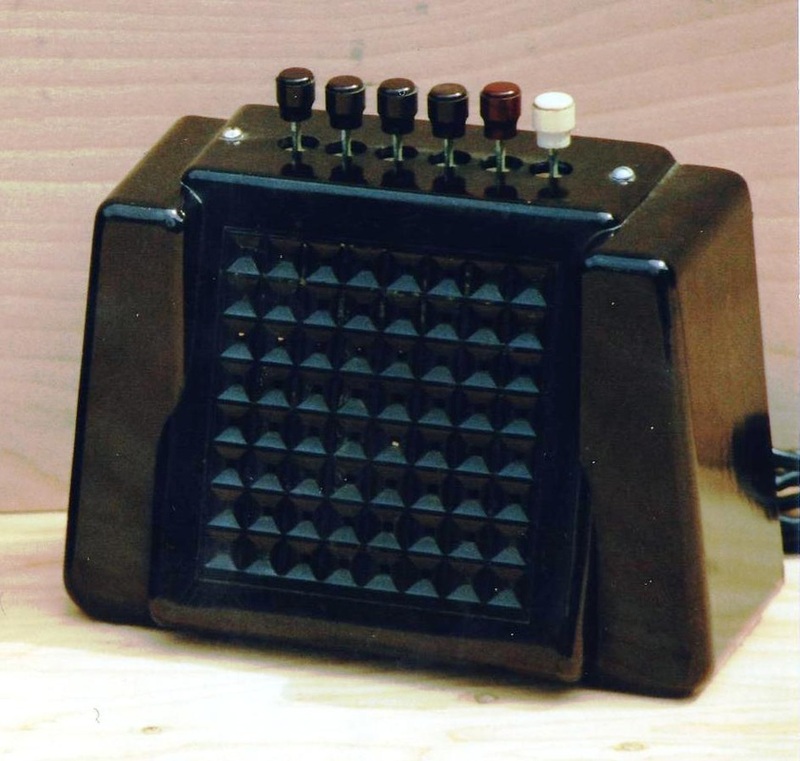 Dictaphone 10-station . Wood: quantity 1. Circa 1940. SKU: ICD15 . NE small 4-station. Oak: quantity 3. Circa 1940. SKU: ICD16. 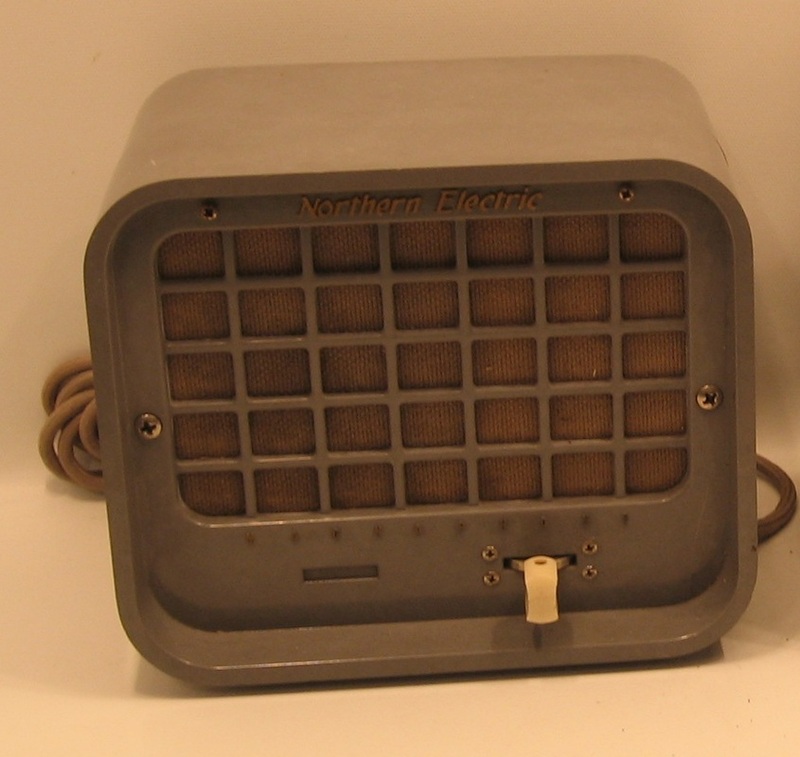 NE 3 line intercom. Wood: quantity 4. Circa 1940. SKU: ICD17. 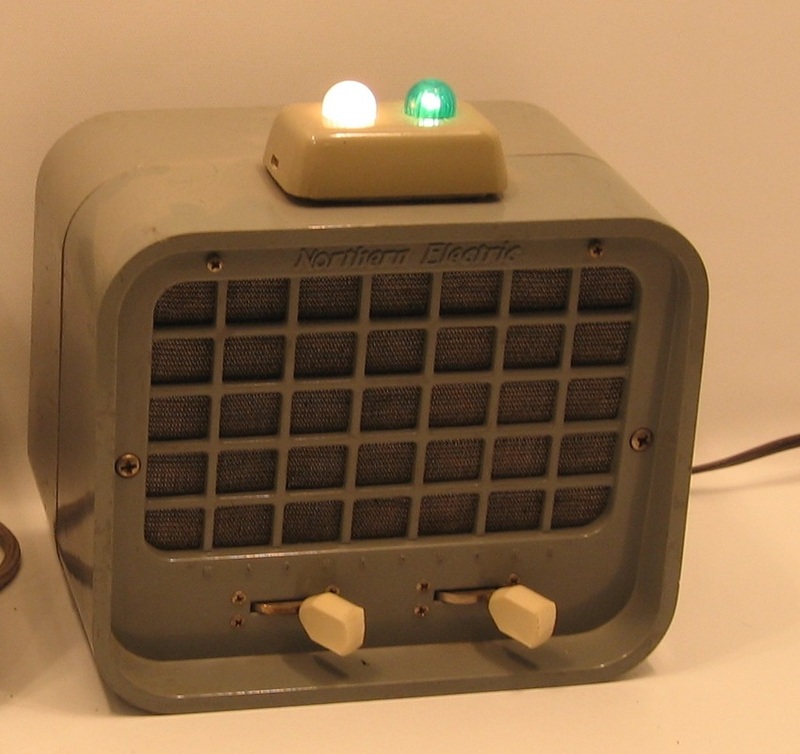 NE 3-line intercom. Wood: quantity 1. Circa 1940. SKU: ICD19. 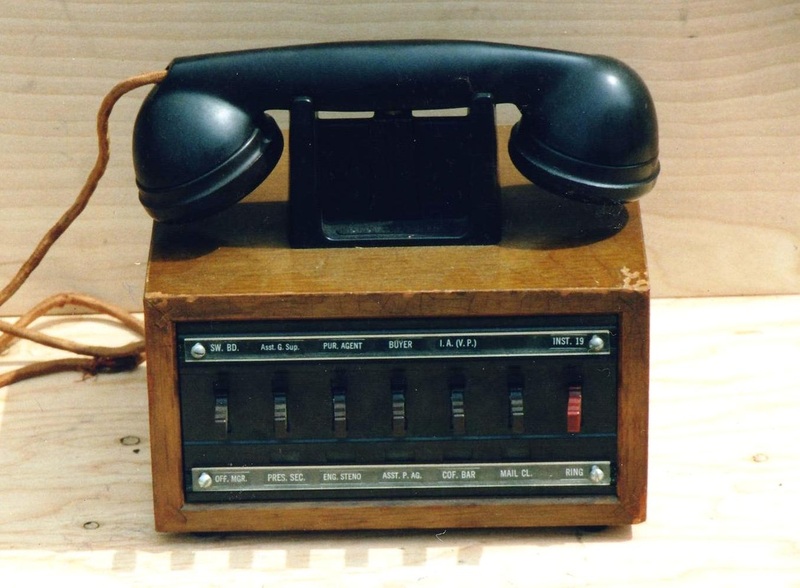 NE 5-station intercom shown with dial answering phone. Wood: quantity 1. Circa 1940. SKU: ICD20. 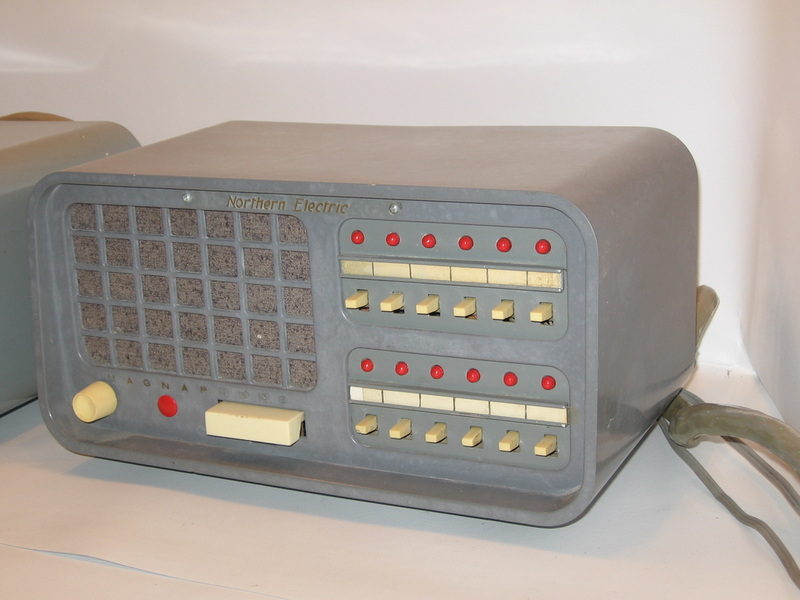 NE 6-station intercom shown with black dial answering phone. Wood: quantity 1. Circa 1940. SKU: ICD40. 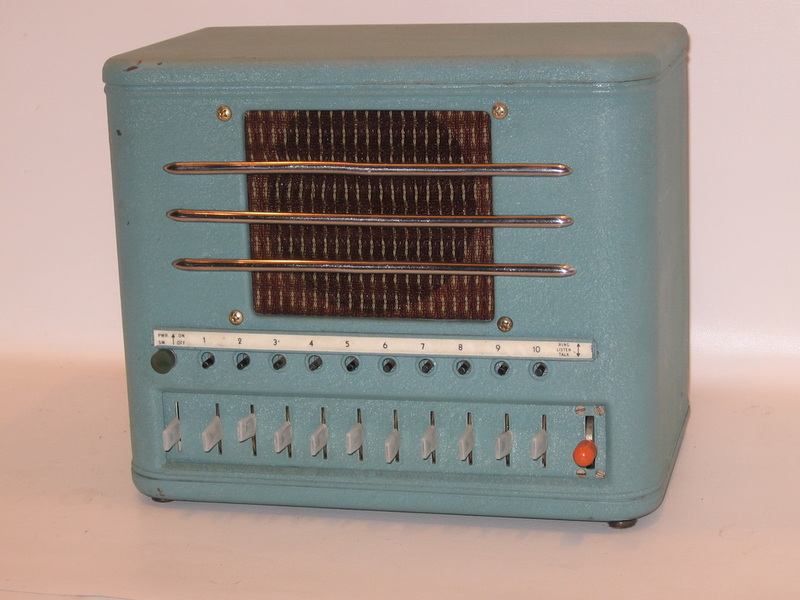 6-button intercom. White: quantity 1. Circa 1940. SKU: ICD31. 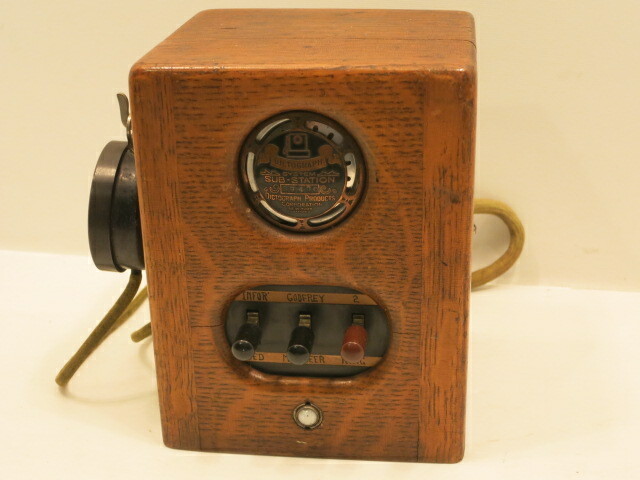 Magnaphone master 12 station intercom. *Working lights. Grey: quantity 1. Circa 1950. SKU: ICD05. 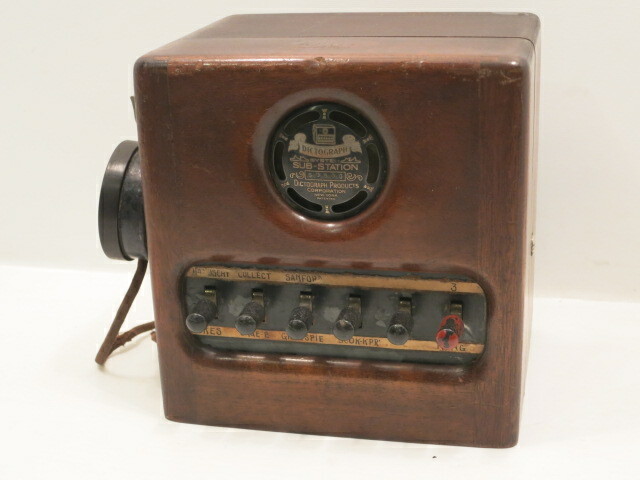 Magnaphone master 6- station intercom. *Working lights. Grey: quantity 2. Circa 1950. SKU: ICD04. Magnaphone substation Grey: quantity 12. Circa 1950. SKU: ICD30. Magnaphone substation. Working lights. Grey:quantity 1. Circa 1950. SKU: CD04. Magnaphone substation. Turquoise: quantity 2. Circa 1950. SKU: ICD22. Ringmaster 10-station intercom with receiver. Grey: quantity 1. Circa 1960. SKU: ICD23. 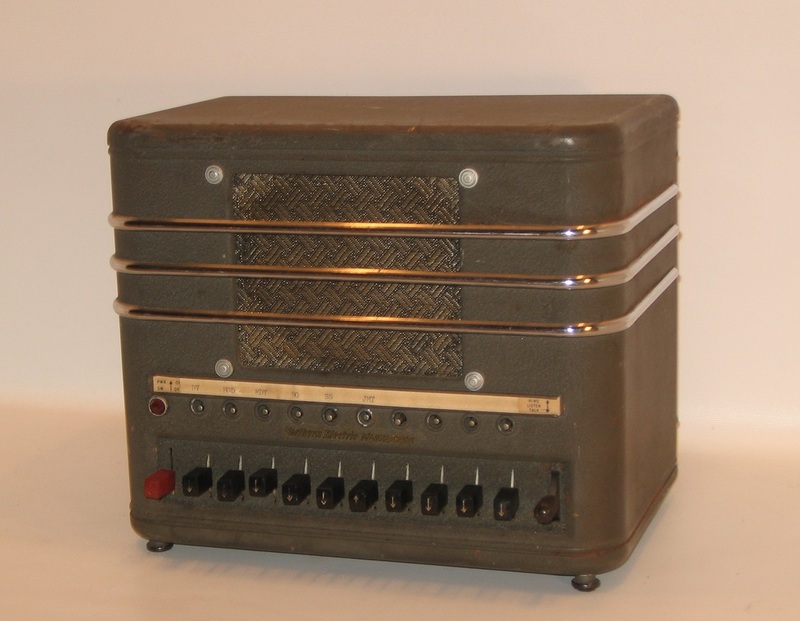 Ringmaster 5-station intercom. 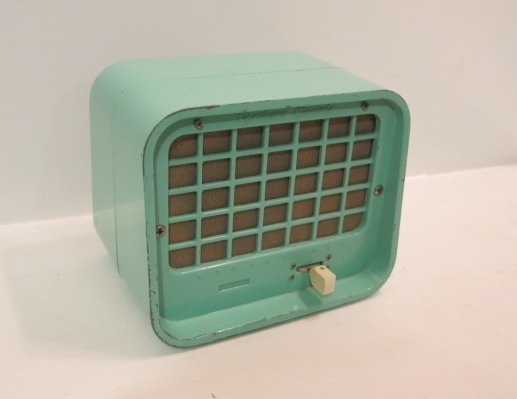 Desk or wall intercom. Grey: quantity 1. Circa 1960. SKU: ICD24. 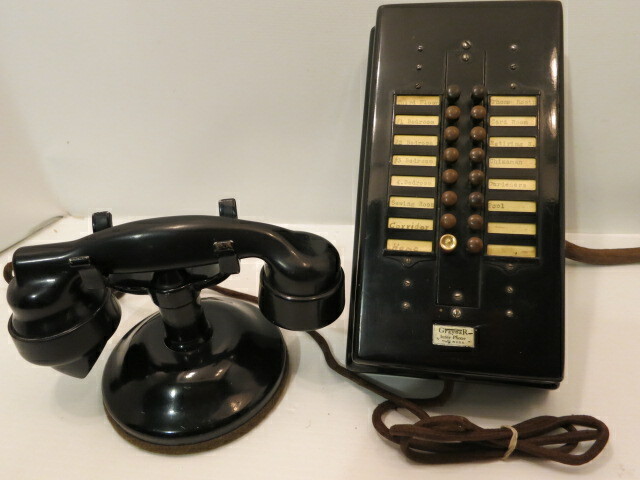 Ringmaster 2-station intercom. 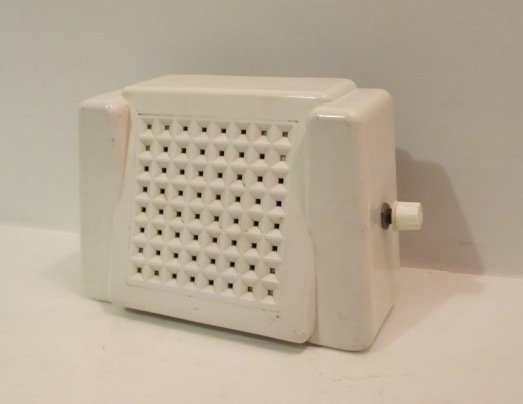 Wall or desk intercom. Grey: quantity 2. Circa . SKU: ICD03. 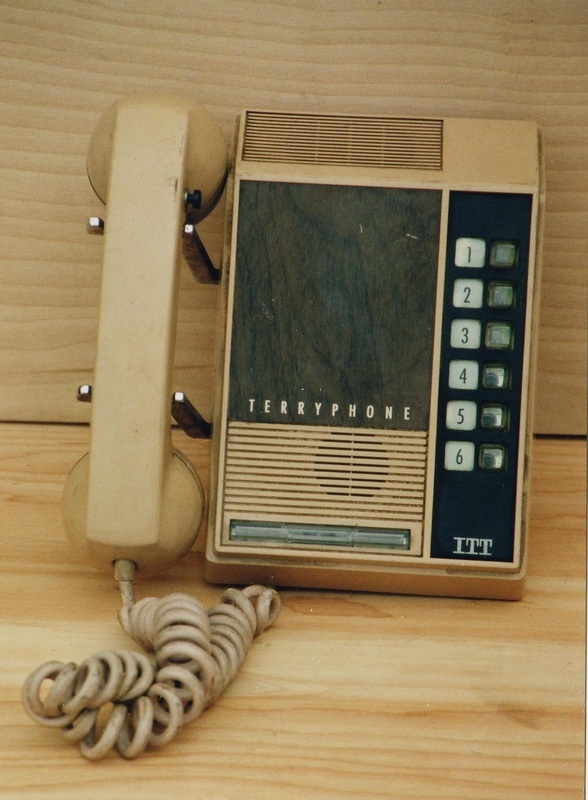 ITT Terry phone. Beige: quantity 1. Circa 1970. SKU: ICD32. 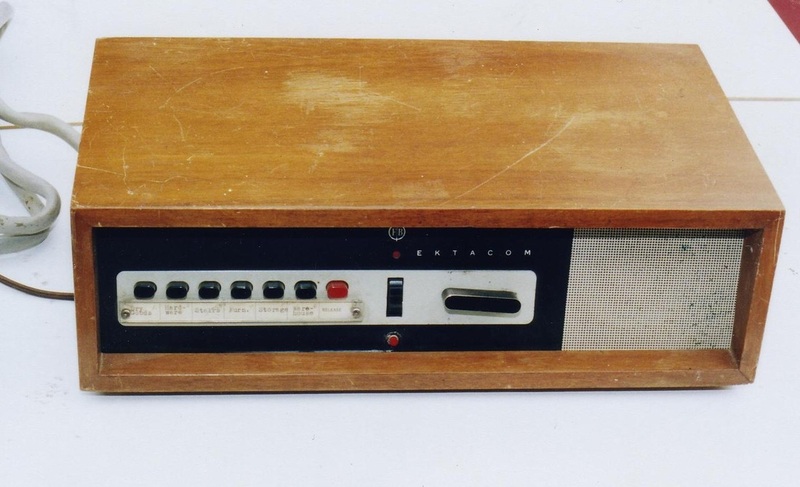 Ektacom paging system. Wood: quantity 1. Circa 1970. SKU: ICD27. 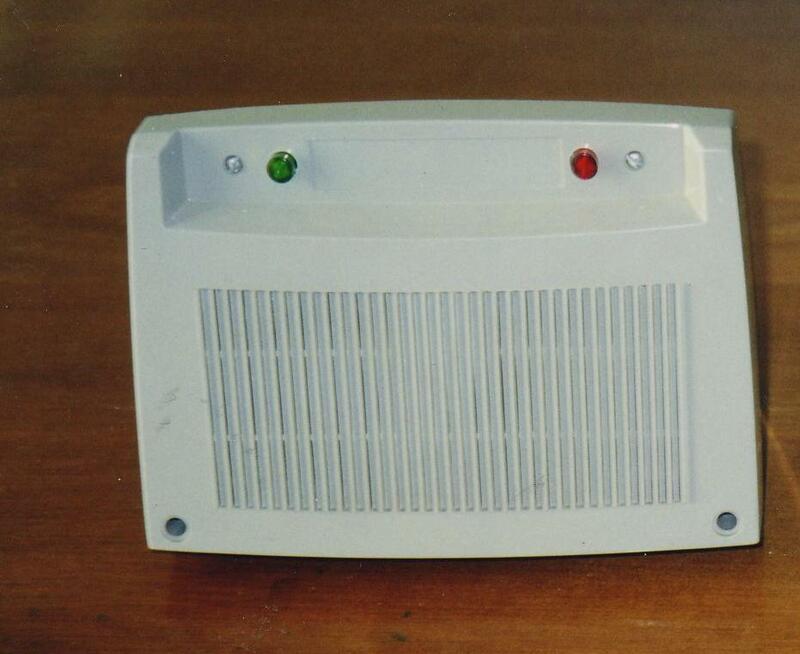 Standup 12-button intercom commonly used in department stores. Ivory: quantity 1. Circa: 1980. SKU: ICD41. Wescom metal desk top intercom speaker. Beige (2), green (1) (not shown). Circa 1970. SKU: ICD42. 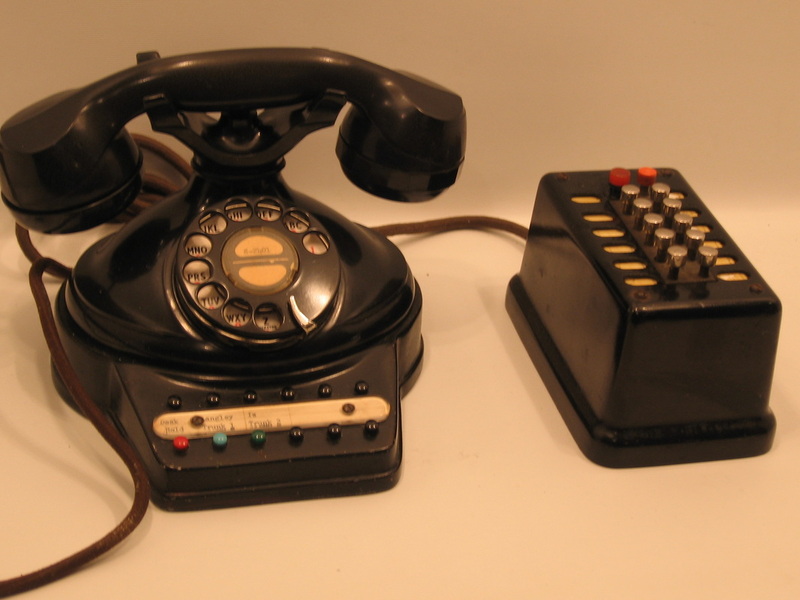 Orator plastic desk top intercom speakers. 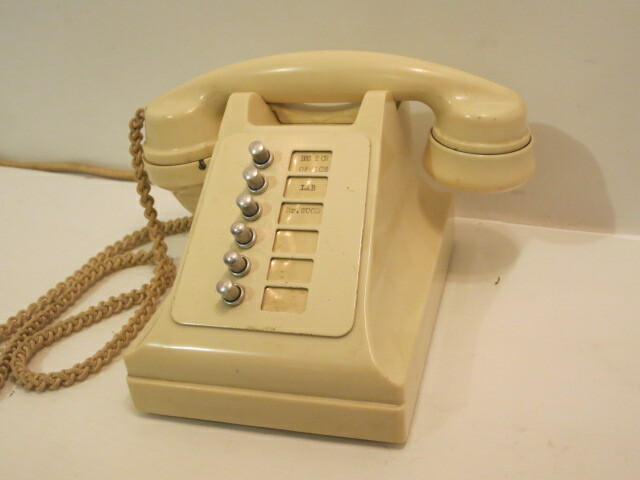 Ivory (1), beige (2). Circa 1982.